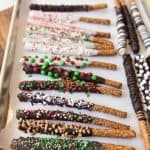 Chocolate Covered Pretzel Rods are a sweet and salty treat that is easily customizable for any holiday or occasion and fun for kids to help make too! Perfect for Christmas, Valentine's Day, the 4th of July, Halloween, or almost any occasion! Sprinkles, mini M&M's, coconut, toffee bits, chopped nuts, etc. Melt the chocolate by filling clean, tall heat safe jars with chopped chocolate or candy melts. Set them into the crock pot and carefully fill the crock pot with hot water until it's about halfway up the sides of the jars, being careful not to get any water into the jars with the chocolate at any time. Set the crock pot temperature to high and let the chocolate sit for about 30 minutes without covering. Use a long handled spoon to stir the chocolate as it melts. Once the chocolate is melted, turn the temperature on the crock pot down to low or warm. Dip pretzel rods into the melted chocolate, shaking off any excess chocolate before transferring them to a parchment lined baking sheet. Sprinkle with whatever toppings you desire before the chocolate has a chance to set, then let the chocolate fully harden before storing in an airtight container. You can also speed up the process by melting the chocolate in the double boiler or with short 20 seconds bursts of heat in the microwave and then just transferring to the crock pot filled partway with hot water to keep the chocolate warm while working with it.